RexGear 1 is an extra wide cube case with plenty of space for cable management, bulky expansion cards, improved airflow, and advanced liquid cooling solutions. This chassis fits full length standard ATX power supply, two large CPU/GPU liquid coolers up to 240/280 mm, and long graphics card length up to 345 mm (with front 20 cm fan removed). Completely removable ODD rack allows easy access to your water cooling solutions. The motherboard plate is removable for easy installation of core components such as CPU, RAM and Motherboard and works great as a computer test bench using AMD Ryzen or as a gaming case. The motherboard's horizontal position also minimizes bending/stress from heavy tower CPU coolers, like the Noctua NH-U12S. You can install a CPU cooler with maximum height of 187 mm (without top fans). You can mount internal 3 x 3.5 inch HDD and 2 x 2.5 inch SSD under the ODD rack. The RexGear 1 comes with pre-drilled holes for water cooling pipes for quick heat dissipation. Includes one quiet, large 20 cm fan (front) and one 14 cm fan (rear). 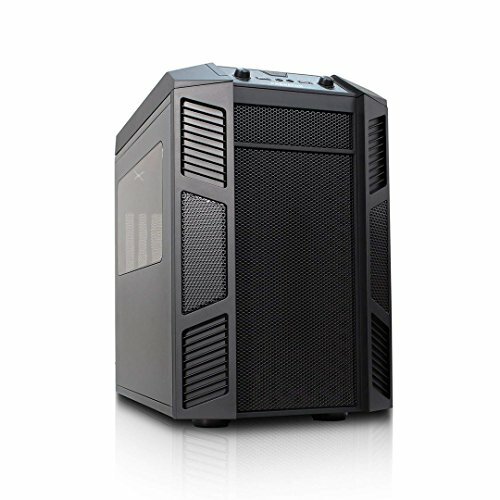 Huge open space for a total of 6 case fans: Optional 1 x 20 cm, 2 x 12 cm or 2 x 14 cm fans on top panel / Optional 1 x 20 cm, 2 x 12 cm or 2 x 14 cm fans on front panel / Optional 2 x 12 cm or 2 x 14 cm fans on rear panel. The top panel includes a functional vent for air ventilation and can be easily opened/closed. Includes magnetic PSU dust filter for easy removal and cleaning. Includes rubber pads for 3.5" HDDs and PSU to minimze vibrations and noises. Includes PSU mounting bracket for easy installation of power supply. Front panel includes 2 x USB 3.0, 1 x HD Audio & MIC, and two fan controller knobs that power up a total of six 3-pin case fans. Case dimensions: 16.45 x 11.02 x 16.22 inches.